There are two types of modes the Stage and Challenge mode. In stage mode there are 4 areas to be cleared these are Waters Wonderland, Mysterious Hollow, Phantasm Stars and Endless Vine. Every areas there are 9 levels and each levels there are required conditions to pass the level. In every level of the four areas, the conditions are all the same but it is modified to be more hard than the previous areas of that level. Level 1: No death occurs within certain meters. Level 2: Kill a number of monsters. Level 3: Collect a number of coins. Level 4: Collect a number of green crystals. Level 5: Fly a certain meters with 3 HPs. Level 6: Kill a number of monsters. Level 7: Collect a number of coins. Level 8: Collect a number of certain items. Level 9: Collect a number of certain items. Run Fast for some distance under invincible state. Launch dense powers and kill all the enemies in front of you immediately. Slide up to use it to defend a hit. It will disappear automatically after a while. Open chests to get random valuable power-ups. Improve the dropping rate of quest power ups in stage mode permanently. 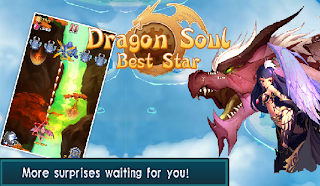 In Dragon Soul Best Star the permanent upgrades are still the best option. Every level increases the difficulty and you can get the BONUS coins ONCE if you pass your current level. If you cant pass the current level, you will having a hard time to save coins. Using consumables will only help you on current level but it will not help you in the future levels and the game increasing it's difficulty per level. The only upgrade you should focus is the bullet upgrade. Bullet upgrade helps you in all difficulties you encounter in this game. It will help you to kill the enemies faster thus helping you to have more SPACE to avoid the falling FIRES. Since it increases your attacks, you can kill more enemies per wave so you can collect more items/upgrades and will lessen your game time. Bullet upgrade costs 1500 coins only the most cheap items in permanent upgrades. The only upgrades are worthy to purchase are Plutos Coming and Double Bullet.